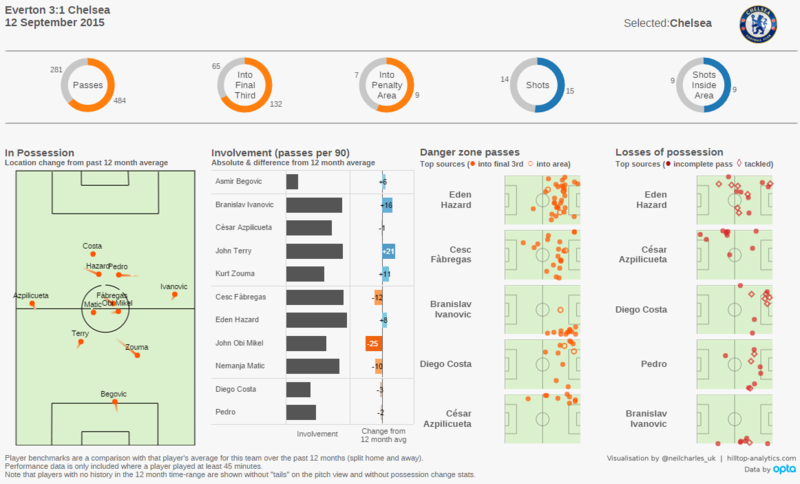 I’ve wanted to build a match summary dashboard for quite a while. 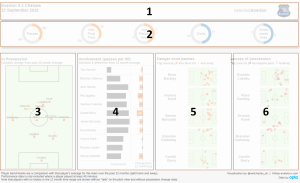 Partly due to dissatisfaction with what I can find out on the web, and partly (along the lines of my player summaries) because I really like the challenge of trying to boil a dashboard down so that it fits onto just one page. My frustration with existing match dashboards comes in a few different flavours. 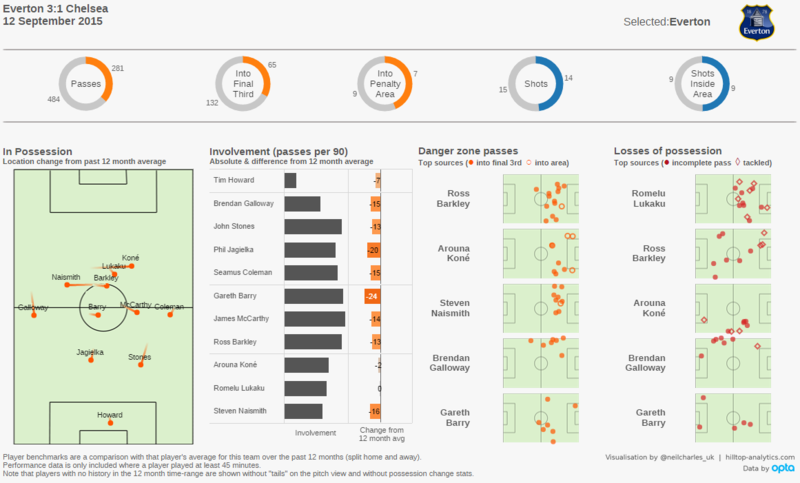 Some dashboards – like the BBC’s – are effective, but very simple. 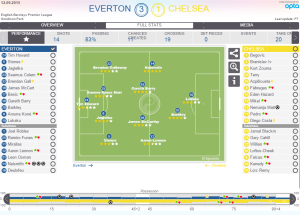 Other views – like some of Statszone‘s – are simultaneously too detailed, without being able to communicate very much information. 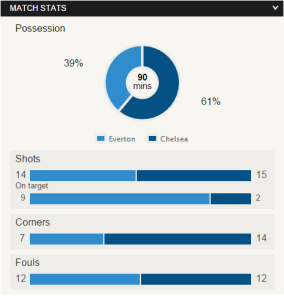 I love Statszone, particularly their mobile app, but what am I supposed to do with the above visualisation? What does it tell me, beyond “football games have lots of passes”? Heatmaps suffer from the same issue. They’re pretty, but don’t communicate much. 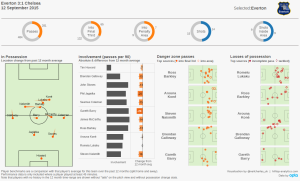 Finally, dashboards like Squawka‘s don’t do an awful lot until you start to interact with them. These can be very powerful, but they’re not an ‘at a glance’ report. And to be fair, they’re not intended to be. Which game are we looking at? What was the balance of possession and shots? Which players played in the game and what were their individual contributions? Building on those static metrics, I then want to develop them to show “is that good?”. Is it good that a certain player saw a lot of the ball? Actually, scratch that, I can’t do “is that good?”. We don’t know for example, how often Arsene Wenger would like Mesut Özil to receive the ball, or where he’d like him to be on the pitch when he does. We could guess, but that would be very presumptuous. 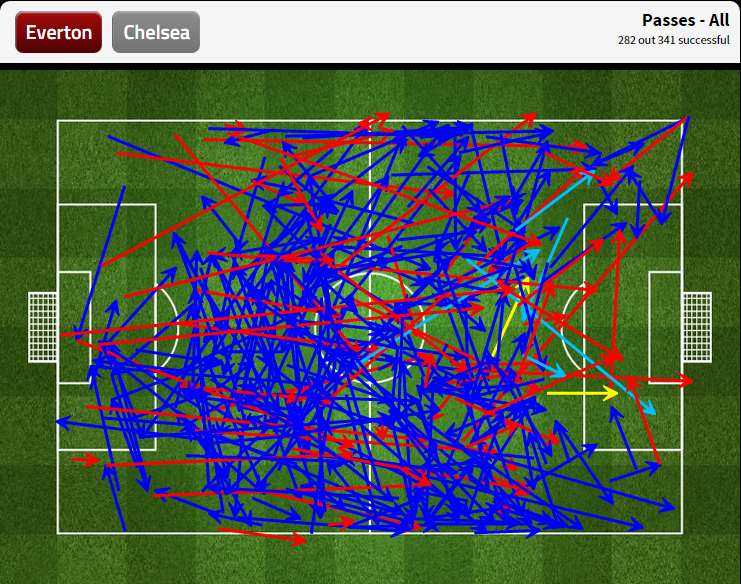 We do know where Özil usually receives the ball and how often. So instead of building targets into this dashboard, we’ll have benchmarks. How different is what happened to Özil in this game, from what usually happens to Özil and Arsenal? Benchmarks are achievable with the information that we have. As a single page report that was designed for a team manager rather than for fans, you might want to have both benchmarks and targets. Enough preamble. 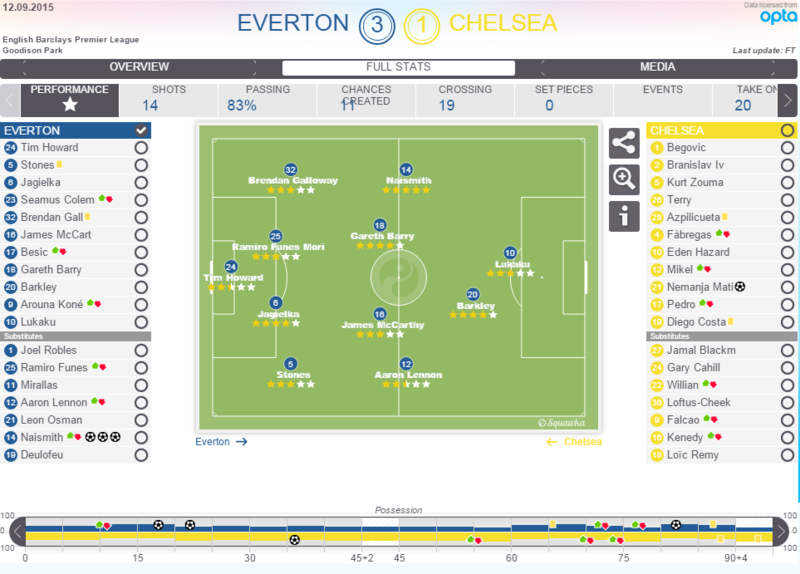 Here are the team dashboards for Everton v Chelsea from last weekend (click for bigger). I actually added this section last, because the detailed elements that come further down the screen left me wondering about simple aspects of the game. What was the balance of play? Which team had the most shots? Yes, those are donut charts. I’m well aware they can be controversial but as a fast, attractive way to communicate a simple “share” indicator, they can be very useful. A number or bar chart instead would work, but detract from the overall look of the dashboard. I’ll probably switch the raw shooting stats for an expected goals model at some point. On average, where was each player? Is that where they would usually be? Which players had the ball most often? 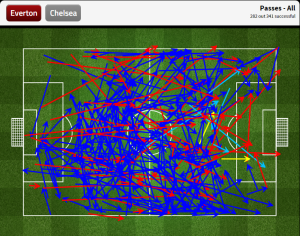 Where did those passes come from? Which players lost the ball most often? Where on the pitch did that happen? 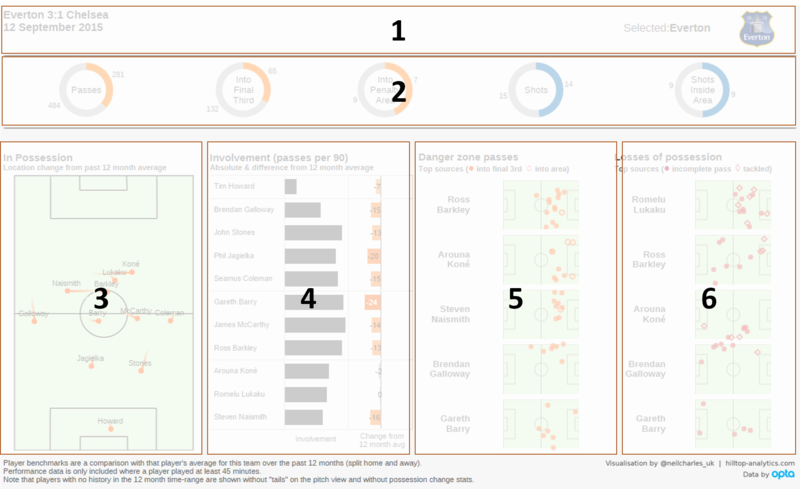 The dashboard will be developing throughout this season and I plan to tweet images from it across the key games each weekend. If you like the dashboard, keep an eye on Twitter, and if you find yourself thinking it’s ok, but missing a key element, then let me know what else should be there!